DArT; genetic mapping; molecular markers; pigeon pea. With an objective to develop a genetic map in pigeon pea (Cajanus spp. ), a total of 554 diversity arrays technology (DArT) markers showed polymorphism in a pigeon pea F2 mapping population of 72 progenies derived from an interspecific cross of ICP 28 (Cajanus cajan) and ICPW 94 (Cajanus scarabaeoides). Approximately 13% of markers did not conform to expected segregation ratio. The total number of DArT marker loci segregating in Mendelian manner was 405 with 73.1% ($P \gt 0.001$) of DArT markers having unique segregation patterns. Two groups of genetic maps were generated using DArT markers. 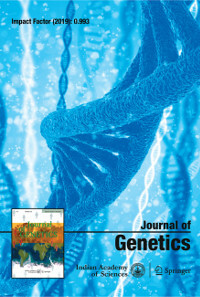 While the maternal genetic linkage map had 122 unique DArT maternal marker loci, the paternal genetic linkage map has a total of 172 unique DArT paternal marker loci. The length of these two maps covered 270.0 cM and 451.6 cM, respectively. These are the first genetic linkage maps developed for pigeon pea, and this is the first report of genetic mapping in any grain legume using diversity arrays technology.